You are at:Home»Sponsored Post»Online backups: can I throw out my external hard drive? As I said in my previous post, Top tips for backing up, losing your data can be a very very traumatic experience, both economically and emotionally. One of the main ways of backing up in the last 10-15 years has been external hard drives, but is that really reliable? One industry that has been growing a lot recently is online backups. Storage space has gotten so cheap that startups have sprung up everywhere offering to backup your data to the â€œcloudâ€. 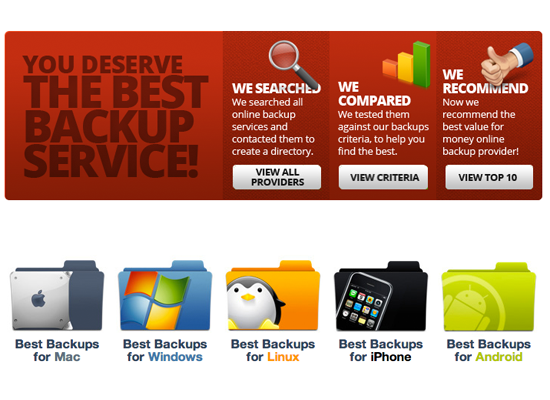 In fact, an online backup review site I found (BestBackups.com) has done reviews for over 50 services, and Iâ€™m sure thatâ€™s probably not all of them. So, can you throw away your external hard drive and just use these services? Well, the short answer is no, since when it comes to backing up, the more you have the safer your data is. But keep in mind that only having an external hard drive for backing up is a huge risk, a power surge or a coffee spill can destroy it. You donâ€™t have â€œlocation redundancyâ€. However, external hard drive backups can be much quicker, and cheaper than online backups since you only have to buy the hard disk once. So, how about cloud backups? Well, the first thing you should know is that the minimum price you will pay is $5 a month. Thatâ€™s about 2 cups of Starbucks, so not too bad. And some providers give you â€œunlimited spaceâ€, which means you can back up all of your data, work, photos, films, absolutely everything. Many services offer â€œversioningâ€, which means not only do you have full backups of files, if you change a file but need an earlier version back, pronto you can just download it from the cloud! The services do have some disadvantages, like the fact that you are trusting someone with all your data. So itâ€™s important to know what t&c-s you are signing up for beforehand. Thereâ€™s also big variations in what features their software has. There are quite a few comparison website that can help you with this, I mentioned BestBackups before, they seem to have the most information out there of the sites I checked. So which one wins? External hard drives or online backups? Actually, both. If you want to be 100% secure, you should use both, that way you have reduced your chances of losing data to almost 0.